Easter is sure to be extra sweet with a dozen decadent brownies in twelve flavors, perfect for loved ones, teachers, kids or simply bringing to the office. 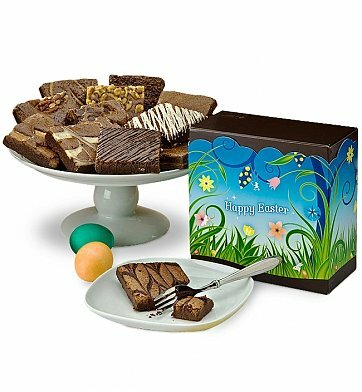 Hand made from fine Callebaut Belgian chocolate and all natural ingredients, these brownies come in a variety of enticing flavors and arrive in a Spring-themed gift box. Each premium brownie is individually wrapped for freshness and arranged in a perfect Easter-themed gift box. One Dozen Easter Brownies is a hand delivered gift. These gifts are delivered by one of our local design centers located throughout the United States and Canada. Same day delivery is available for most gifts when ordered before the cutoff time. The cutoff time for One Dozen Easter Brownies is in the recipient's time zone. Just lovely and so wonderful. I'm still crying because these brownies were so wonderful. They taste great and are so thoughtful. SENT TO GRANDDAUGHTER SHE LOVED IT AND SAID THE BROWNIES ARE VERY YUMMY. THE ITEM ARRIVED ON THE DATE DELIVERY WAS PROMISED. THANKS! For Easter. The delivery was made on time And the recipients loved the Easter treats!